We build Powerful, High Performance, and Custom Content Management Systems (CMS) with rich functionality Cost-effectively – It's time to take control and leverage your website for business growth like never before! A CMS-based website gives you control over it – you don't have to depend on your web developer or development agency every time you want to make changes to your website – be it creating new pages/content, making changes to the existing content on your website or updating your product or price list – you can do all the changes you want through the user-friendly CMS admin panel. You can manage your website without any technical knowledge or professional help easily. CMS website also enables you to develop content on your website and keep it updated with fresh content frequently and efficiently – which in-turn helps your site gain more visibility in search engines. Sounds great? Read on. Our highly skilled CMS developers have in-depth expertise and vast experience in delivering a range of Web Content Management System Development Services and Custom Solutions. We offer both custom CMS and open source CMS development services and our team is capable of developing simple CMS websites to Highly Customized Enterprise-grade Content Management Systems. We also specialize in customizing and integrating the popular content management systems with your existing application. 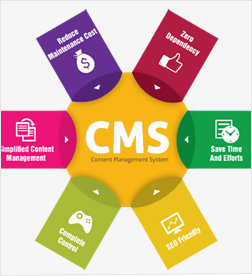 We work with organizations and help them choose the most effective content management system (CMS) based on their requirements or suggest the right custom CMS solution considering factors like the level of customization required and the need for the number of unique functional requirements . Broadly, our initial consulting process includes assisting in identifying business requirements, developing scenarios, or assessing vendors and more. We have expertise in most of the .Net, PHP, Java & other popular based Content management systems. Our team of CMS experts has worked extensively in custom module development of .Net based CMSes like Kentico, Sitefinity, Dotnetnuke, Umbraco & others. We also have vast experience in Joomla, Magento, Drupal, Opencart,Wordpress & other PHP CMS Development and customization. Apart from using the off the shelf CMS, we have also developed complete custom CMS for some of our products like ATSRecruits and LTMLeads. CMS integration – seamless third party CMS integration to your existing application. CMS Migration – Flawless migration from one CMS platform to another. Greater Control and Accessibility – effortless content management with a great user-friendly admin panel user interface. SEO-friendly CMS – SEO-friendly features including option to create custom urls. WYSIWYG Visual Editor – needless to explain, the content you see/post at the backend is what appears at the front-end – you are able to see how the content will appear to the end-user before you publish. Other Features include document and file management, rich media management, work flow management, social media integration, internationalization and localization and more. You are assured that we will deliver a powerful, dynamic, high performance Content Management System (CMS) that will be SEO-friendly, Scalable, Secured and Highly Functional with great features. We are a world-class Offshore CMS development company – so you get the cost advantage without any compromise on quality. We also provide white label services to development agencies across US and Europe. Don't think too much, hiring us for your CMS development will be one of the best decisions you'll ever take, trust us - it's time to get started!